It's been awhile since Marc Jacobs has launched its beauty line. Til today I have not tried any of its product except a few swatches at their counters in Sephora. I took my liking to the foundation immediately, but at the same time I was so fond of the Urban Decay Naked Weightless Ultra Definition Liquid Makeup that I keep purchasing it. Finally, I made up my mind to purchase it since I'm running out of the Urban Decay foundation. And as usual, it has never been my history to buy just one product in a single purchase. 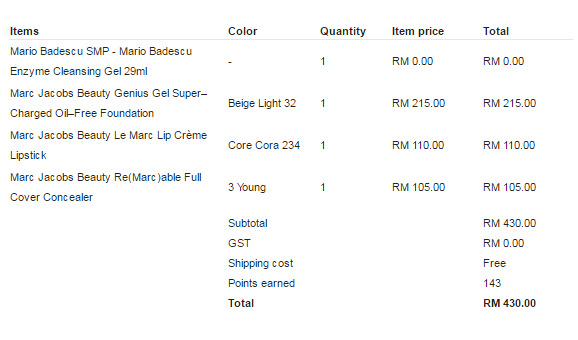 I added in the cart the Le Marc Lip Creme Lipstick and Re(Marc)able Full Coverage Concealer. Get a reputation for perfect skin when you erase imperfections with this richly pigmented, full-coverage concealer. Infused with antiaging and nourishing ingredients, the ultra-emollient formula easily blends with skin, fully covering spots, dark circles, and blemishes for a flawless look worth raving about. Indulge your lips with Marc’s new revolutionary 10-hour lipstick that saturates your lips in luxe and creamy, vibrant pigment with just one swipe. Experience unprecedented colour payoff from concentrated color-boost pigments that are triple-milled and enriched with hydrating ingredients—leaving lips with ultimate long-lasting colour and moisture. The 20 irresistible colour-drenched hues were named after iconic women that have inspired Marc throughout his life. 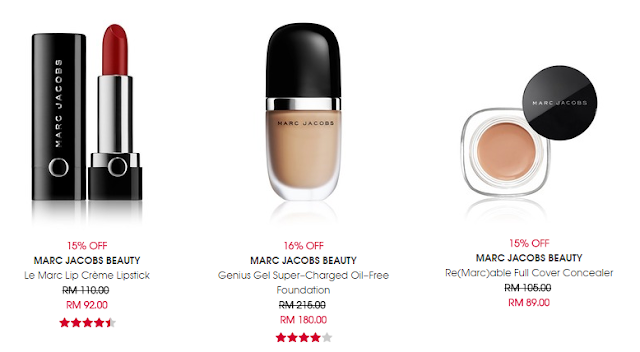 The reason why I picked up those products is because of the Sephora Big Malaysia Sale. From the website, the prices shown were really attractive. It was Sunday. I couldn't contact the customer service because their operation is from Monday to Friday only. The next day the customer service returned my email with a not-so-satisfying explanation that the discounted price was for a specific shades only. The shades that I picked was not under the discount list. They can't exchange my order as well because the discounted shades are all sold out. I'm not sure if it was my fault for not check it out (I'm sure I looked all over the internet but I couldn't find any disclaimer or note from Sephora on this). But it surely not a pleasant experience for my first time shopping at Sephora Online. I find the price was misleading. They should have a special listing with the specific shades under the sales category. For a side note, Sephora Online has the most inventory of stock compared to all the online beauty stores. You can link your Sephora member card online so that you won't miss any shopping perks. Sephora Online is operated by Luxola. Have you shopped in Sephora Online before? Let me know if you have a pleasant experience or bad experience shopping there. I personally prefer its physical store more. I have purchased on Sephora Malaysia and Luxola as well which so far I haven't encountered any issues as such and shipping is fast too. But if I were you I would be very annoyed too. Maybe try calling and checking with HQ directly? @ashwiini - That's what I do always. I try out the products in the physical store and take advantage of the online sales. @Gwendolyn - Yes I checked with them. And their reply was the shade that I choose are not in the sales list. So misleading.